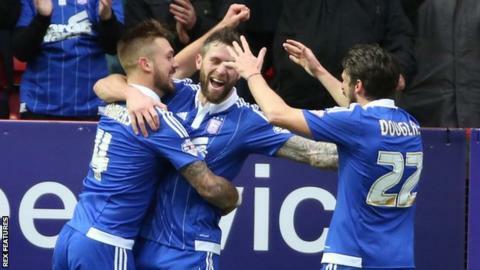 Striker Daryl Murphy scored twice as Ipswich Town extended their unbeaten run to six Championship games with victory at Charlton Athletic. The Republic of Ireland international headed Mick McCarthy's side ahead from close range after a goalmouth scramble. Freddie Sears fired in the second in first-half stoppage time for his first goal in 12 games before Murphy slotted in the visitors' third. Dean Gerken twice saved from Ricardo Vaz Te late on as Charlton went close. Substitute Reza Ghoochannejhad also headed just wide from Chris Solly's pin-point cross in stoppage time but by then Ipswich's victory was already assured. The Tractor Boys have taken 12 points from their last six games and have now won three of their last four, while Charlton have won just one of their last seven home fixtures. Charlton began the game buoyed by back-to-back wins over Sheffield Wednesday and Birmingham and started brightly. But they struggled to create chances against a resolute Ipswich defence and fell behind when Tommy Smith headed back across goal following a sustained spell of pressure and Murphy nodded in. Sears raced on to Luke Chambers' pass to fire in the second with the aid of a deflection off Addicks defender Patrick Bauer. And Murphy sealed victory with a low shot past Stephen Henderson following a neat dummy by Brett Pitman and a precise pass from Jonathan Douglas. Charlton interim boss Karel Fraeye: "There was a foul leading up to the first goal. "We started very aggressively to try and get a goal. All the statistics are in our favour except for one. "It seems unbelievable that we did not score and they got three goals in this game. "The first goal was important and this one should never have been allowed because there was a clear foul and that proved decisive. "The second and third goals did not look good for us but things were against us." Ipswich manager Mick McCarthy: "Freddie [Sears] was diligent in his work in tracking the full-back and then caused all sorts of problems. "Freddie has been selfless, a proper pro in the way he has gone about his business. "I was more relieved than Freddie was when he scored his goal because as much as I say to him after every game 'well done, you're brilliant, I love what you're doing', all he wants to do is score." Match ends, Charlton Athletic 0, Ipswich Town 3. Second Half ends, Charlton Athletic 0, Ipswich Town 3. Corner, Ipswich Town. Conceded by Patrick Bauer. Attempt missed. Reza Ghoochannejhad (Charlton Athletic) header from the centre of the box misses to the right. Assisted by Chris Solly with a cross. Corner, Charlton Athletic. Conceded by Jonas Knudsen. Substitution, Ipswich Town. Tommy Oar replaces Freddie Sears. Attempt saved. Ricardo Vaz Te (Charlton Athletic) right footed shot from outside the box is saved in the bottom right corner. Assisted by Reza Ghoochannejhad. Ademola Lookman (Charlton Athletic) wins a free kick in the defensive half. Foul by Giles Coke (Ipswich Town). Giles Coke (Ipswich Town) wins a free kick on the right wing. Substitution, Ipswich Town. Giles Coke replaces Ainsley Maitland-Niles. Delay in match Ricardo Vaz Te (Charlton Athletic) because of an injury. Attempt saved. Ricardo Vaz Te (Charlton Athletic) header from very close range is saved in the bottom right corner. Assisted by Ademola Lookman with a cross. Corner, Charlton Athletic. Conceded by Ainsley Maitland-Niles. Attempt saved. Patrick Bauer (Charlton Athletic) header from very close range is saved in the centre of the goal. Assisted by Reza Ghoochannejhad with a headed pass. Attempt saved. Brett Pitman (Ipswich Town) right footed shot from outside the box is saved in the top centre of the goal. Assisted by Jonathan Douglas. Offside, Charlton Athletic. Stephen Henderson tries a through ball, but Ricardo Vaz Te is caught offside. Ademola Lookman (Charlton Athletic) wins a free kick on the left wing. Substitution, Charlton Athletic. Reza Ghoochannejhad replaces Simon Makienok. Simon Makienok (Charlton Athletic) wins a free kick in the defensive half. Attempt missed. Christophe Berra (Ipswich Town) header from the centre of the box is high and wide to the right. Assisted by Ainsley Maitland-Niles with a cross following a corner. Corner, Ipswich Town. Conceded by Naby Sarr. Goal! Charlton Athletic 0, Ipswich Town 3. Daryl Murphy (Ipswich Town) left footed shot from the left side of the box to the bottom right corner. Assisted by Jonathan Douglas. Simon Makienok (Charlton Athletic) is shown the yellow card for a bad foul.